Bangladesh Prime Minister Sheikh Hasina said on Tuesday that her India visit was a success and that she had gone to seek friendship, which she got from her neighbour.Answering queries about her April 7-10 state visit to India, Hasina also said there was nothing to hide in the agreements and MoUs signed with India and everything was open to the public. "I did not return empty-handed. I got something. Sometimes I jokingly say -- I wanted water, but got electricity," Hasina told journalists at her official residence Ganabhaban. "I went there to seek friendship. And I got that friendship," Hasina replied when a newsman asked her what Bangladesh got from her India visit.The Prime Minister said nothing happened during her India visit that could make people pessimists. "I am satisfied with the visit. The visit is a success. It's a matter of satisfaction that India has treated Bangladesh as a sovereign state. We have got the honour of a sovereign state," Hasina said.On the sharing of Teesta's river waters, she said Indian Prime Minister Narendra Modi "has pledged to sign the agreement. We can wait with patience for signing it". "They have to release the water, they'll have no option during rainy days, so they'll have to. And we have to find methods to retain it," she said, bdnews24 quoted her as saying. She also spoke about West Bengal Chief Minister Mamata Banerjee's alternative proposal on giving Bangladesh water from four smaller rivers instead of Teesta.She said she was 'pleasantly surprised' that Narendra Modi came to receive her at the airport in New Delhi.Hasina said 11 deals and 24 Memoranda of Understanding (MoU) were signed between the neighbours during the visit.Hasina said all agreements with foreign countries are signed after approval of the cabinet. "So, these are open documents," she said. 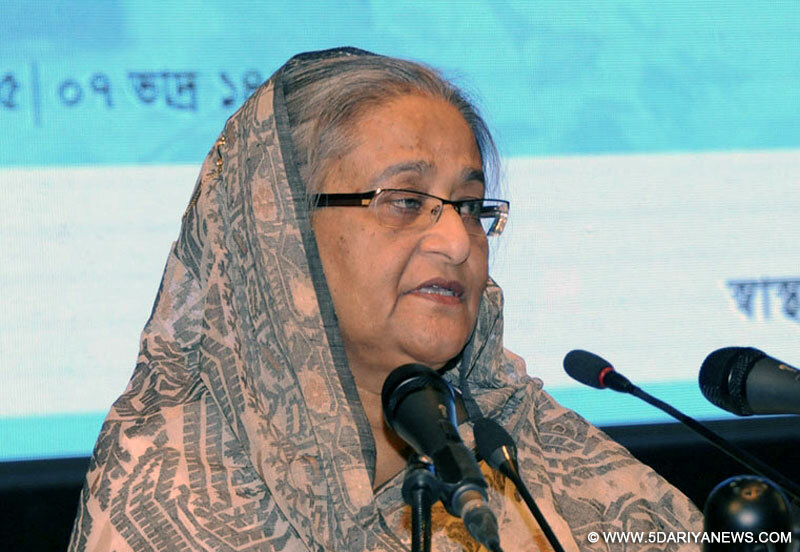 "There is no hide and seek regarding the agreements and MoUs," she said.Asked about the defence deal, Hasina said there is no scope to raise a question over the deal signed with India. "No anti-state agreement will be signed as long as I am alive," she said.She slammed the opposition Bangladesh Nationalist Party for alleging that Bangladesh was being "sold out" to India through her visit. "I am a daughter of Bangabandhu Sheikh Mujibur Rahman. All will have to understand that I am not a person who can sell out the country to anyone," she declared.To a question on her government's policy to maintain relations with both India and China, Hasina said the policy of Bangabandhu - 'Friendship with all, Malice to None,' is the "guiding factor of our foreign policy". "I'm trying to comply with the policy word by word and establish good relations with every country," she said, Prothom Alo quoted her as saying.She said that India and China might have problems in their bilateral relations but Bangladesh would maintain good ties with every country. This was Hasina's first tour to India after the Narendra Modi government came to power in 2014. She also stayed at the Rashtrapati Bhavan, in a sign of the importance India attached to her visit.Hasina said: "The trip was hugely satisfying. There's no frustration. There's nothing frustrating. "Her comments come as Civil Aviation and Tourism Minister Rashed Khan Menon on Tuesday blamed West Bengal Chief Minister Mamata Banerjee for "spoiling Prime Minister Sheikh Hasina's India visit".Referring to Mamata's refusal to change her stance on Teesta water sharing, Menon said "Teesta is an international river. Its water is our right. It is not up to anyone's pity to give us the water. It is our right," he told the Daily Star. "Mamata has besmirched the Prime Minister's otherwise successful tour to India," the Minister said.